The 120VAC Diva-Lite 200 with Travel Case Kit from Kino Flo consists of a Diva-Lite 200 fixture, slip-on Flozier diffuser, lamp case and Clamshell Travel Case. 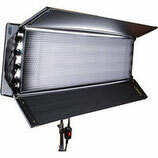 The Kino Flo Diva-Lite 200 is especially designed to provide broad, smooth lighting with a built-in dimming ballast, barndoors and Center Mount. Note: You must specify either lamp color of either 3200k (tungsten) or 5500k (daylight) when renting this light. 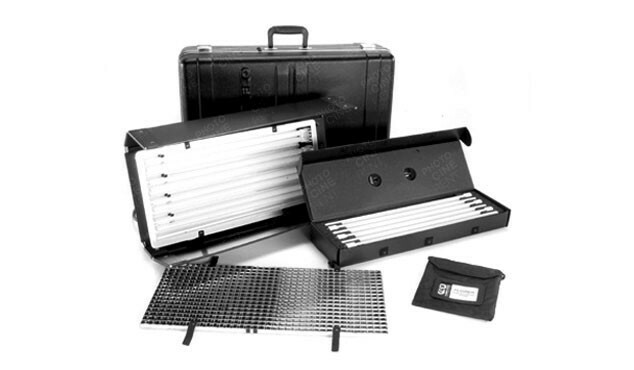 The 120VAC Diva-Lite 400 with Travel Case Kit from Kino Flo consists of a Diva-Lite 400 fixture, slip-on Flozier diffuser, lamp case and Clamshell Travel Case. 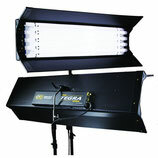 The Kino Flo Diva-Lite 400 is especially designed to provide broad, smooth lighting with a built-in dimming ballast, barndoors and Center Mount. The 4' Kino-Flo 4Bank fluorescent fixture provides soft, cool, flicker-free light like a bounce-source, but with features to control the intensity and spread of the light emitted. It is very portable, and draws very little AC power.This 4' long 120 volt fixture will emit 84 footcandles with a 100° spread, from a distance of 6'. The Tegra 4Bank DMX Kit with Travel Case from Kino Flo combines the features of Kino Flo's popular Diva-Lite and 4Bank to bring you a lightweight fixture with local and DMX dimming and an output equivalent to 1,000 tungsten watts. The Tegra head features a built-in ballast and ships with a Lollipop arm with a 5/8" stand mount and a 90° honeycomb louver. The head features 4-lamp individual switching; turning off 2 lamps equals a power reduction of 1 stop. The energy efficient Tegra 4Bank draws only 2.8A @ 120V AC.